With the BNP getting two members elected to the European Parliament in Britain and various other Fascist organisations doing well in countries as diverse as Hungary, Austria and France, there is a great importance in analysing and understanding these movements in order to prevent the recurrence of what Victor Serge called "The Midnight of the Century". 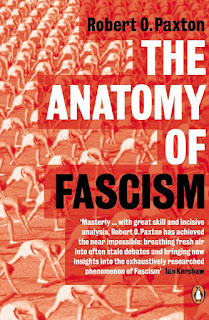 Robert Paxton's work is a well researched, readable and excellent introduction to the debates around Fascism. His explicit reason for doing this, is to understand Fascism, so that it can be stopped. It needs to be made clear right at the start of this review, that while Paxton clearly doesn't describe himself as a Marxist, many of his arguments and positions share similarities with the analysis that Marxists like Leon Trotsky developed. Paxton does not believe that Fascism is simply a more virulent strand of racism. Nor does he think it is a more violent right-wing movement than others. Paxton understands that Fascism comes at an explicit time in history and has an explicit historical role. Although precursors [of Fascism] can be identified before 1914.... adequate space was not available for fascism until after World War 1 and the Bolshevik Revolution. Fascist movements could first reach full development only in the out wash from those two tidal waves. For Paxton, Fascism has a clear purpose, it is "a mass movement directed against the Left". The strength of the Fascist's ability to destroy the organisations of the left and the working class rely on their ability to mobilise large numbers of people. Paxton argues then, that Fascism also requires "mass politics". He develops his theory of Fascism in much the same way that Trotsky does. In various countries, at various moments, the ruling class see Fascists as the only organisations powerful enough to protect their system from threats to it's integrity - revolution for instance. This is particularly obvious with Germany and Italy were powerful working class movements threatened capitalism, or at least the ability of capitalists to exploit workers as they wanted. Having said this, the author doesn't believe that Fascism was somehow automatic, "there was nothing inevitable about the arrival of either Mussolini and Hitler in office". The economic and political crises of the 1920s and 1930s didn't only impact Germany and Italy in those decades, they hit the whole world. So why was Fascism successful in Italy and then Germany, but not say, in Britain, where groups like Moseley's BUF were getting significant support? There are a number of reasons for this. In some countries the ruling class managed to rescue capitalism and undermine working class resistance without resorting to the armed thugs of Fascist organisations. In other countries, the Fascists failed, for various subjective reasons, to be able to portray themselves as viable. In some countries, the Fascists were defeated. Here I think that Paxton under-values the way that in some countries Fascists were physically defeated. The battle of Cable Street in 1936 stopped the BUF in its tracks, breaking its ability to take to the streets to attack Jews and Communists. Yet this gets only a single mention in the book with no analysis of the decline of the BUF afterwards. Similarly in France a mass united anti-fascist movement confronted and broke the French fascist organisations in 1934. Again, barely a mention of these mass movements. Similarly, in more recent times, Paxton fails to mention the success of (say) the Anti-Nazi League and Rock Against Racism in stopping the National Front in Britain in the 1970s. Or even, the huge protests against Le Pen and Haider that have taken place at various points. Again, by ignoring this opposition, we are left with the image of unstoppable movements in Europe with no obvious explanation as to why there isn't a linear rise of the right. This is not to say that every anti-fascist movement has been successful, but it is important to acknowledge that in every country, the majority of people are opposed to the Fascists. Additionally, by not mentioning anti-fascist movements Paxton overplays the importance of specific conditions in countries to make or break fascism at an early stage. He is in danger then, or getting to a situation where he might argue that nothing can be done. Recent history in Britain, has shown that it is possible for anti-fascist mobilisations to serious set-back fascists on the streets. However this is a criticism of this book that is very much in a spirit of dialogue. 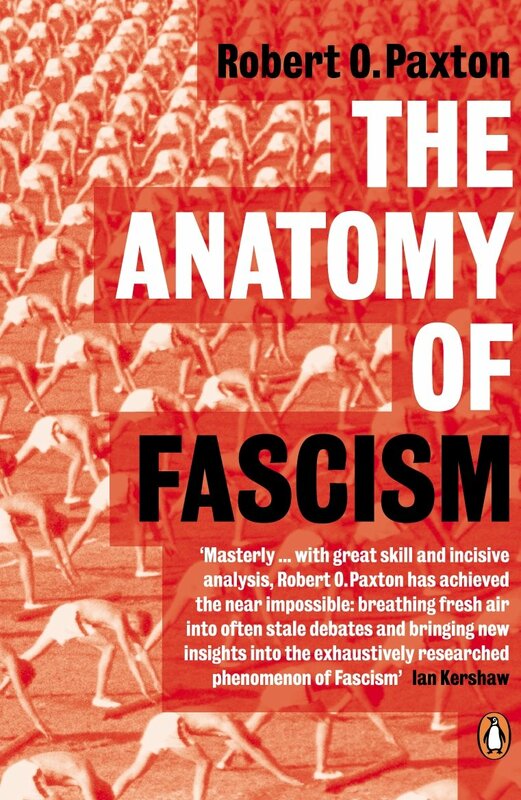 Paxton's explanation of the nature of Fascism, his historical examples of Fascism in action and his description of how Fascism worked in power are extremely interesting and useful. For anyone concerned about the far-right today, this is a very important book. But reading it is only one stage of stopping a repeat of the Holocaust. Getting out and being part of confronting, arguing against and stopping Fascists today is the next stage. Go here for more information on how to do that. I did worry when I put this post up that it would be a magnet for various Fascist trolls from around the world. I have not been disappointed. As someone committed to the principle of No Platform for Fascists, I will be deleting all pro-Nazi comments (trolls or otherwise). Heinrich Böll - And Where Were You, Adam?